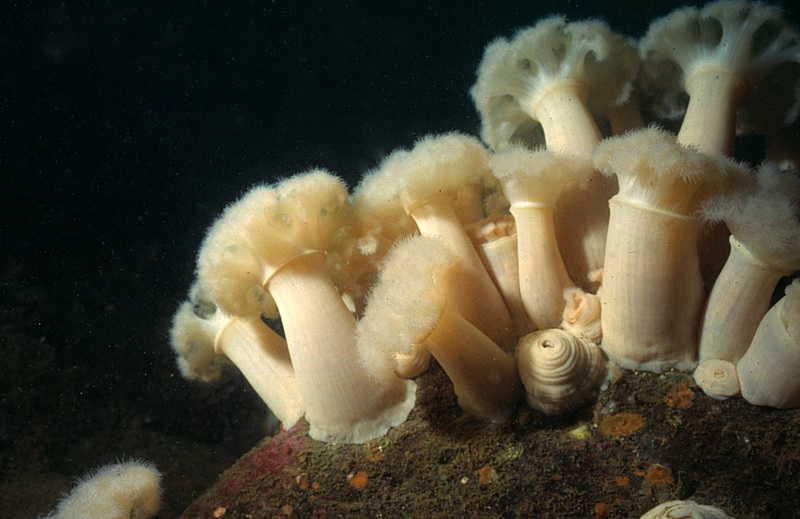 Plumose anemones (Metridium senile) occur in large numbers in good diving areas in temperate waters. 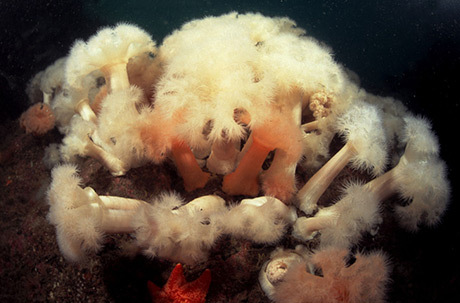 They comprise a tall, smooth column topped with a crown of feathery tentacles. When they contact they look like swirly blobs. Individuals are usually white or orange, although they are sometimes dark green, grey or brown in colour. They grow up to 30 cm tall and 15 cm across at the base. They like areas with currents so tend to live on prominent pieces of wrecks or on rocky pinnacles. 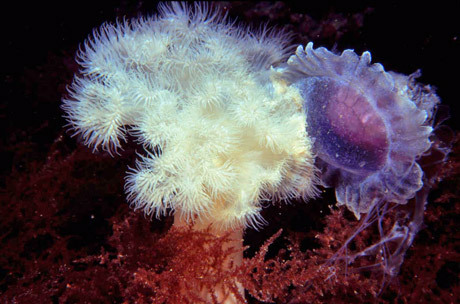 With fine, delicate tentacles they are unsuited to capturing large animals like fish. Instead they specialise in smaller prey such as small planktonic crustaceans. 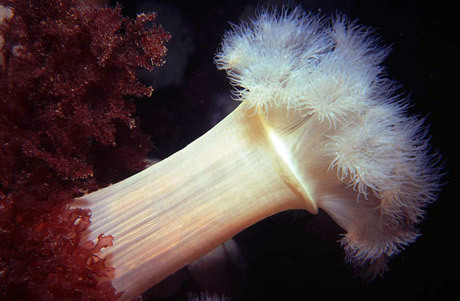 The anemone’s columnar body is narrower just below the tentacles. A current will bend the stalk at this point and expose the tentacles broadside to the flow in the best position for feeding on suspended matter. 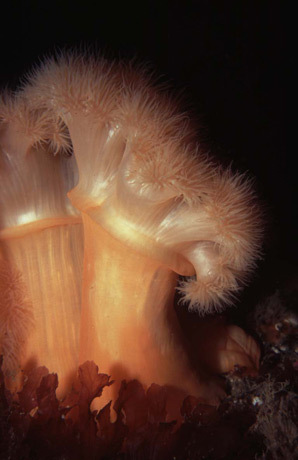 The Plumose anemone occurs from the Bay of Biscay (North of Spain) to Scandinavia in the northeast Atlantic, and on the west and east coasts of North America. It is unknown from the western basin of the Mediterranean but has been seen in the Adriatic, where it is believed to have been introduced. It has also been seen in Table Bay Harbour in South Africa where it was probably introduced from Europe. The common name comes from pluma – feather. The Latin name, which it was given by Linnaeus, is Metridium senile which means Fruitful old. There is some confusion as to whether this has been replaced by the name M. dianthus, but M. senile is still the accepted name according to ITIS – the Integrated Taxonomic Information System. M dianthus is listed as a different species but with “data quality indicators unverified“. 1Jennifer E. Purcell, “Aggressive function and induced development of catch tentacles in the sea anemone metridium senile (coelenterata, actiniaria), The Biological Bulletin 153, no. 2 (October 1977): 355-368.